Bayit Yehudi MKs Ayelet Shaked and Avi Wortzman are conducting negotiations with the Treasury to increase the budgets of hareidi and Religious Zionist yeshivot, a report in business newspaper The Marker said Sunday. According to the report, the two are coordinating their discussions with MKs Moshe Gafni and Ya'akov Asher, (United Torah Jewry) and MK Aryeh Deri (Shas). Wortzman was quoted in the report as saying that he was “very opposed to this cut in the budgets of the yeshivot planned by the Treasury, which amounts to NIS 340 million. We cannot allow such a major cut to this budget. We should be encouraging study in yeshivot. 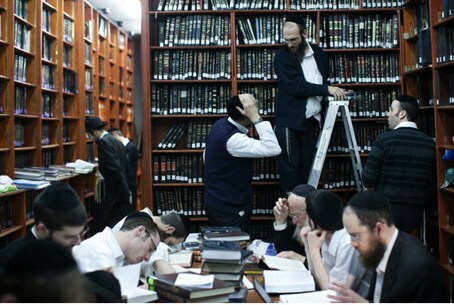 The yeshiva world has experienced natural growth, but its budget has not increased accordingly,” he said. Wortzman added that he has been paying careful attention to statements by Finance Minister Yair Lapid on the matter. “The Torah world is not an issue for hareidim alone, but for the Bayit Yehudi as well. There are many Religious Zionist institutions that will be negatively affected as well, such as the Hesder yeshivot,” he said.